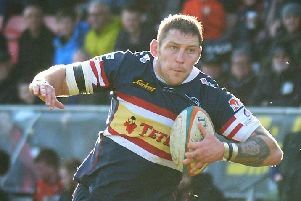 Doncaster Knights are prepared for a battle in tonight’s Championship clash against Moseley at Billesley Common. The Birmingham side, beaten 32-0 away at Cornish Pirates last Saturday, currently prop up the table and are fast running out of games in their efforts to avoid the drop into National One. “It’s a game we’ve got to be looking to win because I still feel that we need around eight points from our three remaining games to retain second spot,” said Knights director of rugby Clive Griffiths. “But I’m expecting it to be a scrappy game because they are down there fighting for their lives and they’ll be fired up. Despite the fact that he felt his charges were unlucky not to beat leaders Bristol at Castle Park, Griffiths admits that there were areas of concern in a generally solid defensive display. “We conceded five tries at home, which is not good enough, even against a side as good as Bristol if you are chasing top spot and want to do well in the play-offs,” he said. Forwards’ coach Glen Kenworthy added: “We also got taught some lessons at the breakdown. Had we had parity in that area of the game we’d have won comfortably.